Obviously behind all that was skepticism towards standardizing certain things. But then we moved from joking to more serious discussion when Ari Tanninen commented that "ISO standard for user-centered design isn't half-bad". He gave a link to a presentation that provides more info about BS EN ISO 9241-210:2010. I was still skeptical. I felt that you shouldn't try to standardize software development. But my point wasn't that. I see a lot of value in software standards. As a web developer I get big benefits myself when browser vendors follow the HTML and CSS standards. Globally speaking, those benefits are gigantic. So yes, IE6(-8) is a sad story and shows what happens when standards are not followed. However, I'm not against software standards, I'm questioning the need for software development standards. Let's make Scrum as an ISO standard? 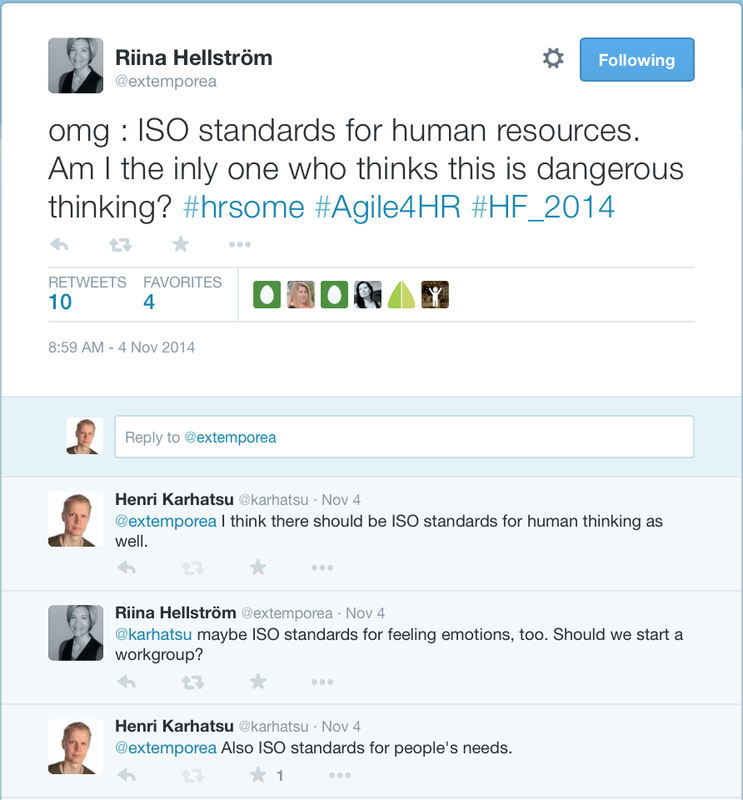 So what if Scrum would become an ISO standard? Companies doing software development would be forced to use it in case they wanted to get certain contracts. Or companies following the standard would have an advantage in competition because they could say how their software development departments are following the standards, which "prove" that they are doing great work. Well, I like Scrum and I think that it has brought a lot of good to the software development industry. On the other hand, it's about 18 months since I was last time using it. And this doesn't mean that I'd been in a vacation or unemployed the last 18 months. It means that I've been in contexts where doing software in some other way makes more sense. You probably already picked one keyword from the text, context. Software development is always very context-dependent, which is one important reason why standardizing it is not so good idea. The same argument works also with the proposed testing standard, ISO 29119. Software testing, as part of software development, is also very context-dependent and creating one standard for it is very questionable. Unfortunately I'm not able to see the testing standard text but for example the contents of the Test Documentation part just scares me. I have worked with big companies and can imagine some horrible scenarios if they would jump into using such a standard. Why is software development different? So why some standards, even software standards, bring major benefits (cost savings, increased market share, even environmental benefits) but I'm against them in software development? I already mentioned context as one important reason. But there is more. Basically I would say that if the aforementioned benefits can be reached by reducing variation, then a standard makes sense. I mean that's what standards are all about, doing a certain thing in a certain way instead of one hundred different ways. So please, be very careful when you try to standardize software development. It can be that you haven't understood the very core nature of it. PS1. A lot has been written about the proposed testing standard ISO 29119. If you are interested to learn more, read for example Stop 29119 by Iain McCowatt, any of these, or this post written in Finnish by Maaret Pyhäjärvi. PS2. Standards are not my specialty. If you think I've understood something wrong about them, I'm more than happy to receive your feedback. Gexton are the best Software Development Company in Hyderabad. Great post! By the way, visit our blog.